If you are planning to buy a water purifier then you were definitely stumble-upon these three water purifier brands Kent, Pureit and Aquaguard. And these three brands have so many water purifiers with many water purification Technologies that’s why average consumers gets overwhelmed and confused which water purifier is ideal for them. No worries. In this article I am going to clear all your doubts and confusions. 1 Kent, Pureit and Aquaguard. Which is the better? 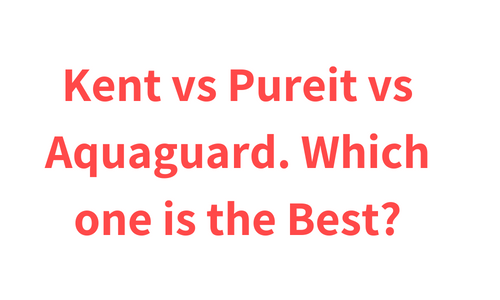 2 So, what is the difference between Kent, Pureit and Aquaguard ? 3 So, what are the differences Kent, Pureit and Aquaguard ? 4 Why RO+UV+UF water purifier is a complete water purification solution? Kent, Pureit and Aquaguard. Which is the better? Honestly this is a very subjective question and there is not a specific answer for everyone. It really depends on your requirements and your budget. Basically all these three brands have good water purifier models. So, what is the difference between Kent, Pureit and Aquaguard ? Basically there is no difference in the water purification technologies of these water purifier brands. Because all the water purifier have either RO or UV or UF water purification Technology or in some cases combination of these three water purification Technology like a RO + UV or UV + UF or RO + UV + UF. So, what are the differences Kent, Pureit and Aquaguard ? You will find difference mostly in the design and build, water storage tank capacity and you may also find difference in the additional features of water purifiers like difference in the alert systems. Also some water purifier comes with built in voltage fluctuations guard and some don’t. And also there are electric and non electric water purifiers. Usually most of the UF water purifiers are non electric because they works on Gravity that’s why they are also called as gravity based water purifier. The water purifier which has UV or RO water purification Technology they need electricity for their working. So you will not only find difference between two water purifier of different brands but also in water purifiers of the same brand. Reading all the above will make you overwhelm and confused but honestly, it is not that confusing when you know your requirements. This guide will help you to know your requirements. And after that it will be a lot easier for you to find an ideal water purifier for you. Besides, usually water purifier having all the three i.e. 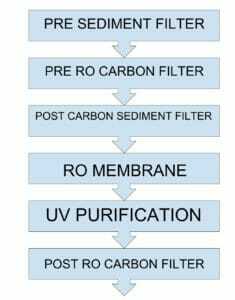 RO, UV and UF water purification is the complete water purification solution and such water purifier can purifier any kind of water. Also some water purifier brands like pureit does not have UF water purification Technology but instead, it uses some similar filters like sediment filter, activated carbon filter, post carbon sediment filter etc which does same job as UF water purification Technology. Why RO+UV+UF water purifier is a complete water purification solution? Because these three water purification Technologies have their own part in the purification and no one water purification technology can perform all the purification operations. So to ensure that the water you’re drinking is 100% safe RO+UV+UF water purifier is recommended by the experts. Now let’s look at the working of each water purification Technology and how it will benefit you. 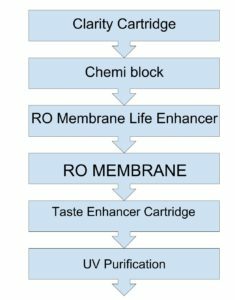 RO water purification contains a semipermeable membrane which has very minute pores which allows water molecules only to pass through it and blocks other harmful dissolved contaminants from the water. This water purification technology is used to purify hard water (high TDS water). TDS more than 500 PPM is considered as hard water (high TDS water). Prolonged consumption of hard water can cause mental and central nervous dysfunction. Also it can harm lungs liver kidney and other other vital organs. You can check the TDS of water with TDS controller at your home which you can buy at Amazon here. Water is passed with great force through this semipermeable membrane which blocks dissolved solids and salts, heavy metals in the water and allows water molecules only to pass through it. Thus making hard water soft and healthy for drinking. In UV water purification UV rays are used to inactivate harmful bacteria, viruses and protozoa from the water making it 100% microbe free. UV water purification is used for the purification of water containing harmful bacteria, viruses and protozoa. The list of diseases caused by harmful bacteria viruses and protozoa is very long. It can cause dysentery, diarrhea, fever, Cholera, hepatitis A, polio, trachoma, ryptosporidium etc. Water purifiers usually have a UV chamber and the UV chamber has UV bulb. Water is passed through the UV chamber where it gets exposed to the UV rays of the UV bulb which inactivates harmful bacteria, viruses and protozoa from the water, ensuring you get 100% micro-free water. You’ll have to take the water sample to a laboratory to check if it is contaminated by microorganisms or not. UF water purification is used to remove visible impurities from the water like sand, mud, dust etc. Prolonged consumption of muddy water can cause Salmonella, hepatitis A and cryptosporidium. UF water purification has UF membrane which remove visible impurities from the water, thus making it clean and clear. So as you can see each water purification Technology plays its dedicated part in the purification process. No one water purification Technology is effective in removing all kinds of contaminants from the water. That’s why water purifiers having RO, UV and UF water purification technology is considered as a complete water purification solution. So here I am going to review three water purifier which have all three RO, UV and UF water purification technologies each from a brand i.e. Kent, Pureit and Aquaguard. This water purifier is build from Food grade plastic which is non-toxic and durable as well. The best part about this water purifier is that it has a transparent water storage tank which you will not see in other water purifiers. Also the water storage tank can be easily removed for cleaning purpose. Additionally this water purifier comes with two LEDs which notifies you whenever you will have to changed its filter or its UV bulb. This water purifier comes with a 6-stage water purification Technology. Additionally this water purifier also comes with a TDS controller which will help you to control its TDS. So if you have water with TDS level of around 450 PPM then you should consider water purifier with a TDS controller as when the water is purified with RO water purifier it reduces the TDS of the water up to 15 PPM and such water is considered as an healthy. This water purifier comes with a water storage tank of 8 litre. The unique feature about its water storage tank is that it is fully transparent which gives you confidence that you are drinking 100% pure water. Besides this water storage tank is detachable as well so you can remove the water storage tank easily for cleaning purpose without any help of professionals. This water purifier also comes with a built in SMPS. SMPS basically works as an voltage stabilizer which stabilizes high voltage ensuring that it will not cause any kind of damage to the water purifier during voltage fluctuations. SMPS also consider as energy efficient as well so it will cut off some electricity expenses as well. RO membrane is very expensive. All the Kent Water Purifier comes with a spin welded RO membrane which is damage proof, ensuring its long life. This water purifier has an alert system which will notify you about filter change and UV fail with its two LED indicators. This feature is quite useful. This water purifier performs all its operations like filling the water storage tank with pure water and automatically stopping this process once the water storage tank is full, which is quite convenient and most of the RO water purifier have this feature. All the components of kent pearl water purifier are Push-fit. It basically means that all the components of this water purifier are attached to each other in such a way that it will not cause any kind of water leakage, which is the big relief. Some users also found stains inside the water storage tank if its not cleaned periodically. So if you are looking for a transparent water storage tank then Kent pearl is definitely a good choice for you. Besides the water storage tank of this water purifier can be easily removed so you can clean it without any help of professionals at your house. Additionally this water purifier comes with all the essential features like SMPS which works as voltage stabilizer, pushpit component which prevents water leakage and alert system which will notify you whenever you will have to change its filter and UV bulb. It performs all its operations like purifying the water and filling it in the water storage tank and automatically shutting down the purification process once the water storage tank is full. Pureit Ultima RO + UV with oxytube is a very advanced water purifier. This water purifier has a very unique modern design comparing to all the other water purifier available in the market. This water purifier comes with an elegant, fully digital display which you can see in only Pureit Ultima series, which enhances its modern looks. This water purifier also emits a blue light whenever you dispense the water to fill a glass of water which looks really cool. Besides this water purifier comes with oxytube which is the unique feature of this water purifier and you cannot see this feature in any other water purifier available in the market. The first germkill kit can purifier water upto 4000 litres. And second germkill kit can purify water upto 8000 litres. Besides modern and elegant looks Pureit Ultima RO + UV with oxytube comes with a 6-stage water purification Technology. This water purifier also have an inbuilt TDS modular as well. The first stage of water purification is consist of Pre-sediment filter which removes fine and coarse particulate impurities and dust from the water making it clean and clear. The second stage of water purification has Pre-RO carbon filter which removes chlorine and harmful chlorine by-products, organic impurities and pesticides. The third stage of water purification has post carbon sediment filter which removes remaining visible impurities like dirt from the water ensuring that the water is 100% clean and clear. The Fourth Stage has a RO membrane which removes dissolved salt and solids. It also removes heavy metals like arsenic, lead and Mercury from the water, which ultimately removes the hardness of the water. The fifth stage of purification is of UV purification. The water is exposed to the UV rays of the UV bulb at this stage of water purification, which inactivates the harmful bacteria, protozoa and viruses from the water it also removes harmful parasites from the water. Post RO carbon filter comes in at the 6 stage of water purification which basically enhances the taste of the purified water. Additionally the TDS modular adds essential minerals in the purified water. This water purifier comes with water storage tank of 10 litres which is fully covered. Fully digital display is the feature which offers this water purifier a very modern and elegant look. This fully digital display is quite practical as well. Its display basically shows you the life of the two germkill kits with the two digital round circles. It will notify you 15 days before the germkill kit is going to get over which will help you to plan the maintenance of this water purifier in advance. It’s digital display also comes with a purity indicator, which will show you the real time data about purity of the water. Additionally this water purifier comes with guided alert system which will notify you whenever there will be any kind of electric fault in the purification process with Red Band on the display, ensuring that you get 100% pure water every time. The most unique feature of this water purifier which makes it different from any of the water purifier available in the market is its oxytube. This water purifier comes with an oxyblast technology which removes Chemicals and pesticides from the surface of the fruits and vegetables ensuring that it is safe for consumption. You will find the oxytube in this water purifier only. This water purifier performs all its operations from purification to dispensing the purified water automatically. This water purifier automatically purify the water and fill it in the water storage tank and will automatically shut down the purification operation once the water storage tank get fully filled. This water purifier does not comes with a normal traditional tap. The dispensing of the water is also done with the help of electricity. You just have to push the button and it will dispense the water. This water purifier also stops all its water purification operations once the germkill kit gets over, ensuring that you get safest water every time. This water purifier also comes with a built in voltage fluctuation guard which will stabilize the current during the voltage fluctuation ensuring the long life of this water purifier. Users like the modern, futuristic and elegant design of this water purifier. They also found the oxytube helpful as well. Some users also cause trouble during power cut as this water purifier performs all its operations with the the help of electricity and uses electricity for the dispensing of water as well. So without electricity with water purifier is of no use, even if there’s purified water stored in its water storage tank. If you are looking for a modern, elegant futuristic water purifier which will enhances the look of your kitchen then this water purifier is a great choice for you. Besides this water purifier has a 6 stage water purification ensuring that you get 100% pure water every time. Additionally this water purifier comes with an oxytube Technology which removes harmful pesticides and Chemicals from the surface of fruits and vegetables ensuring that you’re eating safe fruits and vegetables as well. So it is a complete purification solution. This water purifier also comes with other additional features like fully digital display which will show you the real time data about the purification of water. It will alert you about the life of the germkill kit 15 days before it is going to get over. It will also notify you whenever there will be any kind of fault in the water purification. Besides this water purifier also comes with a built-in voltage fluctuation guard which will stabilize the current during the voltage fluctuations, ensuring the long life of the water purifier. This water purifier also has a 10 litre water storage tank and it performs all its operations automatically like filling the water storage tank with purified water and automatically shutting down the purification operation once the water storage tank is full. This water purifier does not comes with a normal traditional tap for dispensing of water. It has a button for the dispensing of water and it requires electric city for the dispensing as well. Overall this water purifier is a complete purification solution as it not only will purify water but also removes harmful chemical and pesticides from the surface of fruits and vegetables. This water purifier requires electricity for the dispensing of water as well. So obviously without electricity this water purifier is of no use even if there is a purified water in its water storage tank. This water purifier is equipped with RO, UV and MTDS water purification technologies. It comes with 6 litre water storage tank and it also has some good features like Smart Performance during Voltage Fluctuations which basically protects the water purifier during voltage fluctuations. Aquaguard Smart Plus have a very compact design which makes it ideal for small and medium size kitchens. Also it has decent modern looking design. At the front it has various indicators like water level indicator and it has normal water dispensing tap. It does not have transparent water storage tank. Its water tank is hidden behind the outer cover which also protects it from any invasion of insects and dust particles. Aquaguard Smart Plus is equipped with RO, UV and Mtds water purification technology. It completes its water purification in six stages. Now let’s have a closer look at each stage its filter and its working. The first stage of purification is of clarity cartridge. At this stage suspended impurities like sand, mud, dust, etc are removed from the water. Chemi-block comes in at the second stage of water purification. At this stage various organic impurities and bad taste and odour causing contaminants are removed from the water. Municipal water is generally treated with chlorine for purification which forms harmful chlorine by-products in the water and such harmful contaminants are removed at this stage of water purification. Membrane Life Enhancer comes in at the third stage of water purification. as RO membrane is expensive this stage basically works as a protective layer for RO membrane by preventing calling of dissolved calcium and magnesium. 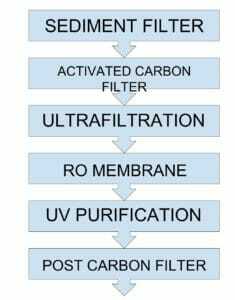 RO filtration comes in at the fourth stage of water purification. RO membrane have very minute pores which allows water molecules only to pass through it and blocks all the dissolved solids and salts from the water. The water is passed with a great force through this RO membrane which removes excess TDS from the water, ultimately converting hard water into soft water. Taste Enhancer Cartridge comes in at the 5th stage of water purification. As the name suggest, this cartridge basically helps to enhance the taste of the water and as it contains Carbon Granules it is also able to absorb all the remaining organic impurities from the water. UV disinfection chamber comes in at the 6th stage of water purification. At this stage the water is passed in the UV disinfection chamber where it gets exposed to the UV rays of the UV bulb which inactivates harmful bacteria, viruses and protozoa from the water. Aquaguard Smart Plus is equipped with mtds which basically allows you to control the TDS of the water manually. It works the same way as TDS controller. The technician who comes to install the water purifier will have essential tools like TDS metre to check the TDS of water and he will adjust the TDS of the water accordingly. With RO, UV and Mtds water purification technologies and 6 stage water purification with good filters Eureka Forbes Aquasure from Aquaguard Smart Plus have decent water purification system. Users are also very happy with the performance of this water purifier. You can check the customer reviews about this water purifier at Amazon here. The water storage tank is not transparent and it is hidden behind the outer cover of the water purifier which also provide protection from invasion of any external insects or dust particles. Though it doesn’t have a transparent water storage tank but it comes with water level indicator but its water level indicator is somewhat unclear but it does serves the purpose. This indicator will notify me whenever the water storage tank will get fully filled. As this is an automatic water purifier you don’t have to manually turn off the water purifier once the water storage tanks will get fully filled, it will automatically shutdown the water purification process and it will also restart the water purification process once the water level decreases in the water storage tank. As this is RO water purifier it requires a decent amount of water pressure for proper working. With this indicator it will notify you if the water purifier is not getting enough water pressure for proper working. This indicator will notify you if the water purifier is not getting water supply. This indicator will notify you in case of any error in the machine of this water purifier. This water purifier does not comes with a filter change indicator which is a bit inconvenient. So you will have to change its filter periodical. After how much time you will have to change its filter is really depends upon the quality of the water and the amount of water this water purifier is purifying. Usually you will have to change its filter annually. This feature basically protects the water purifier during voltage fluctuations ensuring its long life. If you are looking for a compact water purifier with good water purification system then Eureka Forbes Aquasure from aquaguard Smart Plus is ideal choice for you. This water purifier has a very compact design and decent look. It is equipped with RO, UV and Mtds water purification technology and 6 stage water purification system. The MTDS basically works as a TDS controller and it allows you to control the TDS of the water manually. Also it have a decent alert and notification system but it doesn’t come with filter change indicator which is a bit inconvenient. Also it has 6 litre water storage tank. Also it is equipped with voltage fluctuation guard which protects it during voltage fluctuation which is pretty helpful feature. Over all users are pretty happy with the design and performance of this water purifier. Kent Vs livpure Vs Aquaguard. LG water purifier vs Kent Water Purifier. Comparison Between Pureit Ultima and Aquaguard Magna.